The Indo-Pacific Tarpon or Megalops cyprinoides is a fish capable of living in freshwater and saltwater. 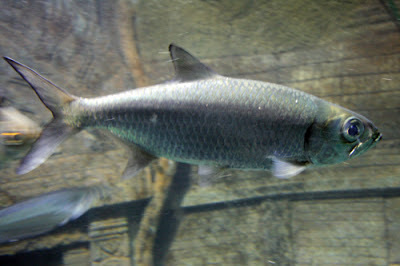 Also known as the Oxeye, Broussonet Tarpon, Hairen or the Ten Pounder, this fish can grow to about 1 meter (3.3 feet). If you have had the pleasure of hooking one of these fish you probably have noticed that they fight much harder then most fish of the same size. They are also surface jumpers, and will certainly give you a run for your money on light tackle with long runs, and lots of stamina. This species looks a lot like it close relative, the much bigger Atlantic Tarpon. It's body is covered with large scales with a blue-grey coloration and a silver belly. They have a forked tail and an elongated dorsal fin. These fish have a large mouth compared to their body size with a protruding jaw that is pointing upward, and no real teeth. If you are fishing for Indo-Pacific Tarpon you will generally find them in estuaries and coastal waters, rivers and mangrove forests. The best way to catch these Tarpon are with flies, spinners, sub-surface lures or shrimps. These fish have made their way into the aquarium trade, but they require a MASSIVE tank so they are only recommended for the advanced aquarium enthusiasts. You can check out one in an aquarium in the video below. POP QUIZ: Do you know the names of the other fish featured in the video above?